All companies have data, but not all companies are data-driven. Being data-driven means looking at data before you make decisions. For this to happen, every decider in your company needs fast, on-demand access to fresh data. Today, we’re excited to announce the public preview of something that does just that. Say hello to the new Treasure Data console—a full-featured Integrated Development Environment (IDE) for processing and analyzing data. Paired with Treasure Data’s elastic compute cloud and suite of rich data connectors, it’s everything you need to do all your analytics in one place. To see it in action: walk (don’t run) over to your nearest data analyst and have them click the try new version button in our top navigation bar, then hold onto your hat. Every part of this experience has been built for speed. Queries respond faster, searches are more relevant, and ad-hoc analysis is easy to collaborate on. Let’s take a look! Every part of the UI has been cleaned up to make it easy to navigate and manage your data. Our team spent thousands of hours working alongside analysts to understand their workflows, rebuilding our entire navigational flow to put the right controls at your fingertips exactly when you need them. 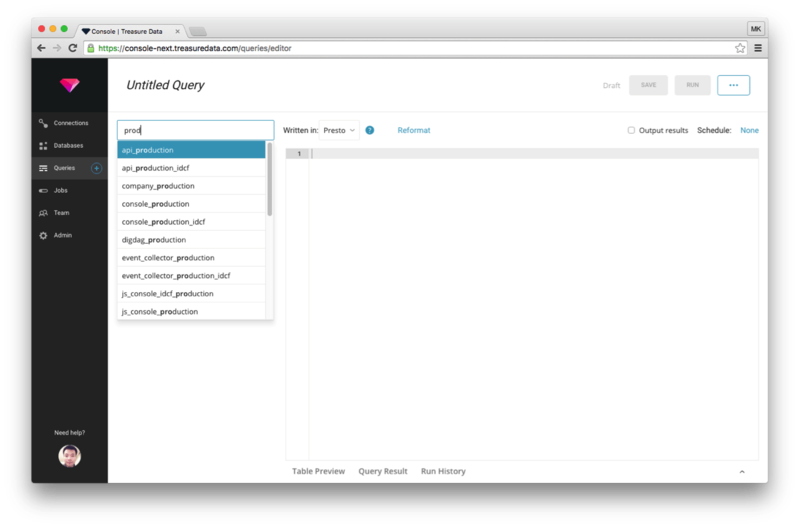 To see this in action, let’s start by creating a new query. 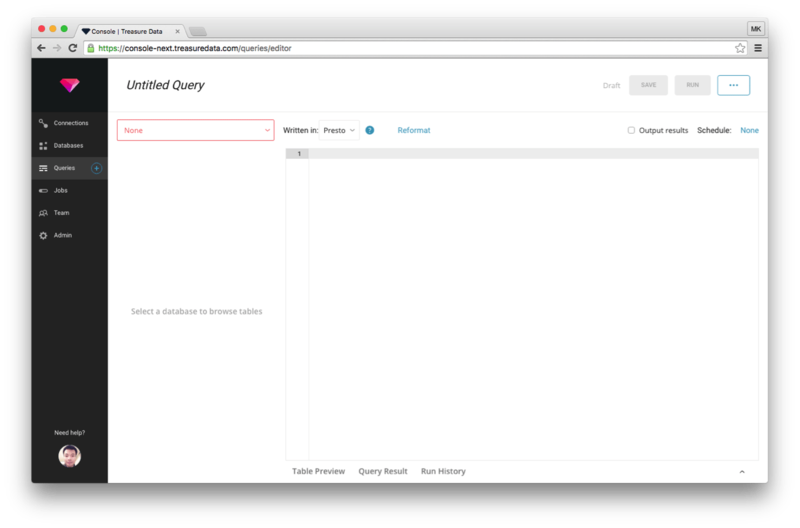 You can get to the New Query page quickly, by clicking the icon next to the Queries tab in the left navigation panel. Clicking on the highlighted search box in the upper left corner brings up a complete list of available databases. If you have a lot of them, you’ll enjoy the hyper-responsive autocomplete we built from scratch. Just start typing, and results are filtered in real time. If you’re impatient like the rest of us, you’ll probably notice another new feature: the sheer speed at which search is performed. Type and the results appear instantly. No delay. This is a good time to brag about the massive performance improvements to the entire interface. Everything is now built on React.js, with virtualized web components that allow long lists and tabular components to be rendered in the blink of an eye. The console can now keep up with the blistering performance of everything else in the Treasure Data stack. Autocomplete has been completely revamped. It’s now fast and smart. Not only does it suggest keywords and custom functions from the language you’re writing in (we support Hive, Presto, and Pig), but it also autocompletes column labels from your current table as well. Combined with new keyboard shortcuts for the most common commands, it’s hard to overstate how much faster you can fly. Are you done yet? Because we’re not! 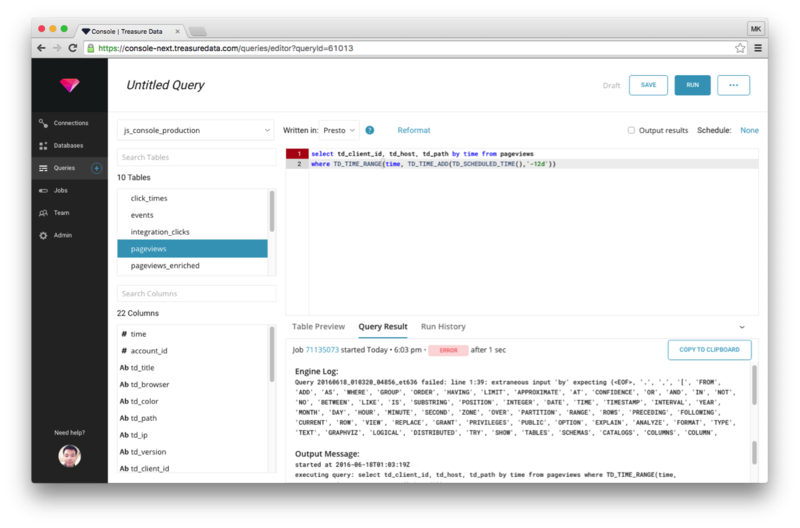 Now you can run a query and see results in the same window. No more flipping back and forth between tabs just to see that you forgot to close your WHERE clause. Say hello to editing AND debugging all in the same view. Now you can iterate until your query runs without errors, and even sanity check the results. It’s worth noting that these results are also paginated. Meaning you can flip directly to the back page and see if the end of your results table looks as pretty as the beginning. This is just a small preview of all the new features in our beta console. Log in now to find the rest! If you have any questions or feedback, operators are standing by! If you’re not already a Treasure Data customer, we’ve got you covered. Sign up for a free trial or request a custom demo and you can join the party too!